Every summer the Hidden Creek Lake, a glacier lake ten miles north of town, busts it’s dam. This usually happens during the first few weeks of July. 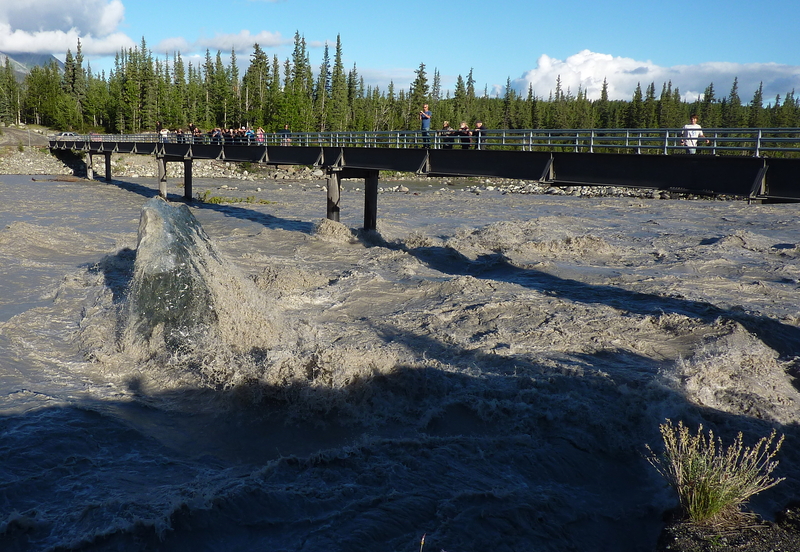 When Hidden Creek Lake drains it floods nearby waterways, including the Kennicott River. The banks corrode, and large chunks of ice charge downstream. In the picture above, one of the larger pieces of ice is cart-wheeling towards the bridge at damaging speeds. Half the people have already fled the bridge, fearing a piece of solid ice the size of a school bus could damage the pillars. However, the one guy wearing the blue shirt, standing on the railing, demonstrates what it is to be fearless. Luckily the ice missed the pillars, but might have struck and warped the bridge downstream. One of the great things about McCarthy, or small towns in general, is that events like these are big news and are talked about for days. In fact, I can’t remember this much excitement since the great Grizzly/Moose chase through Kennicott. That created such a buzz that the event was reenacted by costumed performers in the Forth of July parade this year. Maybe next year someone can build a float that looks like an iceberg and another like a bridge. The floats could then crash into each other. It sounds fun to me.